New Delhi, April 5: Sunrisers Hyderabad posted a hat-trick of wins in the ongoing IPL to move to the top of the points table and stand-in-captain Bhuvneshwar Kumar said a skipper's job becomes relatively easy when the team does well. After losing their opening IPL match against Kolkata Knight Riders, the Sunrisers went on the win three back-to-back games against Rajasthan Royals, Royal Challengers Bangalore and Delhi Capitals. SRH beat DC by 5 wickets | Delhi Capitals vs Sunrisers Hyderabad Live Cricket Score 16th T20 Match. "When the team does well, captaincy is always easy. 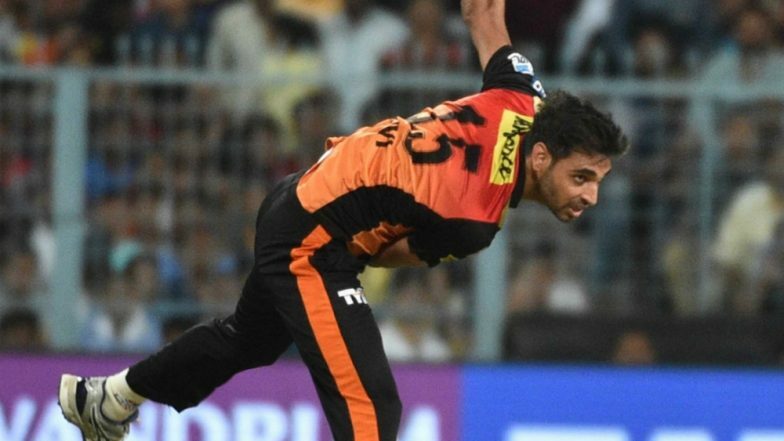 Captain is as good as his team," Bhuvneshwar said at the post-match presentation ceremony after Sunrisers beat Delhi by five wickets here last night. The Sunrisers captain said it was a difficult wicket to bat on. "With the toss we were not sure how the wicket was going to play. We were not surprised but we knew it wouldn't be too slow in the second innings," he said. Bhuvneshwar feels that all the pitches across the country would behave in similar fashion as the tournament progresses. "Second half of the IPL, it's going to be slow all over India, and we have to be choosy with our eleven." Delhi Capitals skipper Shreyas Iyer said the batting department let his side down yet again. "Last two games have been the same. Tough wicket and since they bowled first, they had a bit of an idea how to go about it. We didn't bat well. It's another learning, we should come back positively," he said. "After the first time-out, we thought 140-150 would have been a great total. And we had three spinners, so we could have pounced on them. Unfortunately we were short. I needed a little bit of support from someone at the other end from someone in the top 4. But it's a good lesson for us. "The way we came back in the second innings was appreciable. The bowlers came up and that is good to see," Iyer added. Man-of-the-match Jonny Bairstow, who struck a quickfire 48 off 28 deliveries, also opined that the wicket on offer at the Feroze Shah Kotla stadium was a difficult one for shot-making. "There was probably a little less bounce. It was a good toss to win, so we were able to see how to play on wickets like that. Probably the first such pitch we've come across this season," he said. "I am really pleased with the start, just going to try and keep going. We have three games in quick succession now and hopefully we keep playing the same brand of cricket."